Fr. 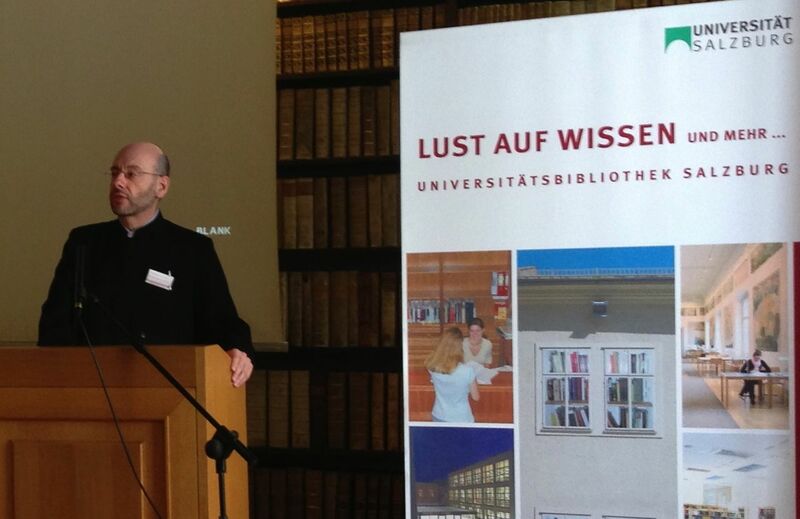 Daniel Findikyan lectures at the University of Salzburg last week on Armenian Monasticism. Dr. Jasmine Dum-Tragut, Lecturer in Linguistics and Armenology and Dr. Dietmar Winkler, Professor for Patristics and Church History at the University of Salzburg co-organized the event, which brought together specialists in Armenian and Eastern Church Studies, monasticism, and ecumenism. Representing the Armenian Church, apart from Fr. Findikyan, were Abp. Nareg Alemezian, Ecumenical Coordinator and Dean of the Armenian Seminary of the Great House of Cilicia, Bishop Hovakim Manukyan, Director of Ecumenical Affairs for the Holy See of Etchmiadzin, Fr. Pakrad Berjekian of the Armenian Patriarchate of Jerusalem, and Fr. Ruben Zargaryan of the Holy See of Etchmiadzin. Also participating were monks of the Benedictine Monastery of St. Peter in Salzburg, which was founded in the mid-eighth century and has operated continuously since. Speakers traced the history of Armenian monasticism from its origins in the fourth century in Armenia and the Holy Land to its decline during Ottoman times, and its decimation as a result of the Armenian Genocide. The massive theological, scientific, artistic and intellectual contributions of Armenian monks throughout Armenian Christian history were displayed. Also surveyed was monastic life as it has reemerged in the twentieth century in the Armenian Church’s hierarchical centers and signs of a renaissance in Armenia today, with young men retreating to ancient, outlying monasteries in pursuit of solitude, prayer, and study. Also noted were small but growing numbers of young women in Armenia who are coming together to live out the monastic ideal. By arrangement of His Holiness Karekin II, Catholicos of All Armenians, two young sisters will travel to Salzburg later this Spring to spend time in Salzburg’s eighth-century Benedictine Convent under the supervision of its dynamic and gracious Abbess, Mother Perpetua. Fr. Findikyan’s paper, entitled, “Penitential Spirituality in Armenian Monasticism at the Turn of the Millennium,” studied a controversial theology of human sinfulness that emerged in some northern and eastern Armenian monasteries from the 11th to the 14th centuries, which resulted in the development of liturgical practices such as the closing of the altar curtain and the withholding of Holy Communion during Great Lent, practices that present a number of theological, liturgical and practical problems in Armenian Church life today. All of the papers will be edited in a book to be published in English in short order.